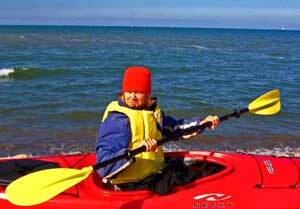 Some of you know that Peter and I have become avid kayakers We just paddle around on Lake Erie but it is ever changing. We had this beautiful hot summer where after paddling all you would want to do is jump into the lake and cool down. Things have changed a bit and we have now donned wetsuits and pulled out warm hats. 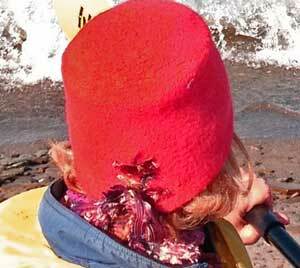 I made this hat last spring and it was so warm that I couldn't wear it but now it is perfect for the lake and the cold winds. Because it is felted the wind is impenetrable and the water spray beads on top of it. That all being said, I have to tell you I'm feeling pretty stylish out there while staying warm. The hat, well it is called the 1920's Ribbon Hat. The Imperial Yarn Company folks are the ones that publish this pattern. I used Malabrigo Worsted, color Bergamota 94 for the hat and then Gedifra Costa Rica , color number 3801 for the ribbon. It is definitely a fun little knit and perfect for the wet, cold weather ahead.